First of all, let me THANK YOU ALL for all the thoughts, sympathy, and love that you have sent our way as we face the disasters that have been hitting us hard here in Japan, particularly the north and east parts of the country. Your words, prayers and helping hands have touched to my core as we struggle to get through a tide of problems as more are mounting up. And THANK YOU also for your support to my little campaign to raise fund for disaster relief efforts in Japan by making a donation or spreading a word, when I haven't even given full details on the little giveaway I say I am doing as a part of the campaign. So without further ado, let's get down to the business: it's a sakura (cherry blossom) baking ingredients giveaway that I would like to offer in appreciation for your generosity. * UPDATE 3/22: the giveaway is now closed - thank you everyone! Donation is still accepted and very much appreciated. As I have already mentioned in my last, quick post here, I had been thinking for a while about doing a little giveaway, as over the past year I have had quite a few inquiries as to where and how they might be able to find some of sakura-flavored baking supplies, especially cherry blossom extract (flavoring), among other things I used when I baked a bunch of things in cherry blossom flavors. Many of these sakura things are available only for a limited time of the year, i.e. in early spring - before the real blossoms come to full bloom. They usually come around at the end of February or early March. So I started my shopping, mostly online, at the beginning of this month, and things had started arriving... when the earthquake hit. As an ominously long quake we felt here in Nagano turned out to have been a humongous earthquake that struck the coastline in Tohoku hundreds of miles away and devastated hundreds of thousands of our people, I became less and less sure if this was the time for me to be doing such a lighthearted thing as a baking supplies giveaway. But since I had already bought far more of the stuff than I'd use up before the end of this spring, I wanted to put it in a good use - and thought it would make indeed a good use if I used it as a part of fundraising for the relief efforts. 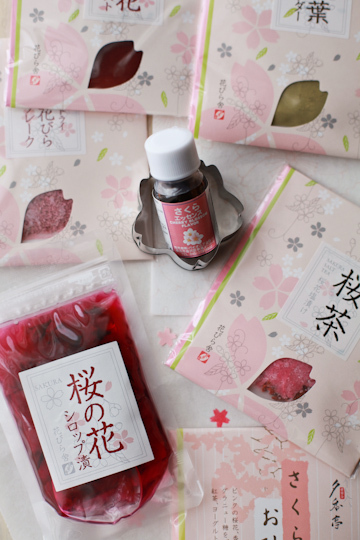 A few selected, small-portion packs of various cherry blossom (and leaf)-based products, a tiny bottle of cherry blossom flavoring, and a cherry blossom-shaped cookie cutter. This tiny 10-ml (1/3 oz) bottle seemed to have been some sort of most sought-after item among some of food bloggers for the past year or so. A few drops of this cherry blossom flavoring adds a subtle, sweet scent slightly reminiscent (perhaps naturally) of cherries. The flavoring will not give your desserts astrong flavor, and it is not supposed to - what you'd want is a just waft of light floral scent. Note that this is not a so-called flower water, like rose water or orange flower water. So use sparingly or it can give an unpleasant flavor to your dessert. As I wrote a bit about it last spring, sakura in traditional Japanese baking (and cooking) mostly takes forms of salt-cured blossoms and leaves - flowers particularly for their visual attractiveness, and leaves mostly for flavor. Both have potent flavor and are very salty, so they need to be rinsed first to remove excess salt. And unless you are using them for garnish (such as when you make sakura-mochi), you'll most likely to do a bit of preparation before using flowers or leaves in baking. That is when these pre-chopped/dried/flaked/sweetened sakura products come handy. 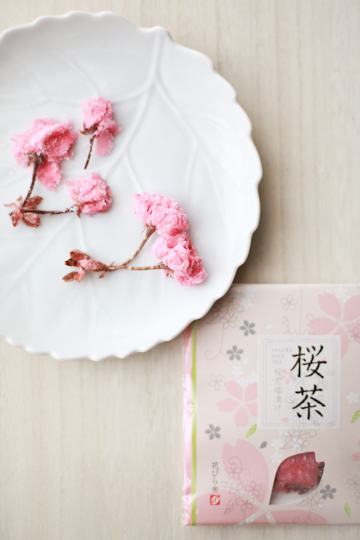 Perhaps the easiest to use of all is sakura sugar, or granulated sugar blended with salt-cured cherry blossoms and leaves, dried and flaked. With the flavors of both the flower and leaf, this flavored sugar is sweet and salty all in one with a hint of vinegar from the cured blossoms. The back of the package suggests that you can sprinkle it on toast, yogurt, ice-cream, or shaved ice, or use it in baking. Cherry blossom flakes are freeze-dried and flaked salt-cured blossoms, pretty in pink and good for topping for cappuccino, ice cream, chocolate truffles, and cakes, as it suggested by the manufacturer. Sweetened cherry blossom paste is also made from salt-cured blossoms, pureed and sweetened, making it suitable to mix into mousse, ice cream, and whipped cream. Cherry leaf powder, meanwhile, is salted cherry leaves that have been dried and ground to powder. It makes a nice contrast to pink hues of blossoms, and totally has its own thing going. You can use it in baking by adding it to a batter/dough, or else mixing it with sugar to sprinkle on toast. ...And might as well, the real stuff too; salt-cured cherry blossoms. 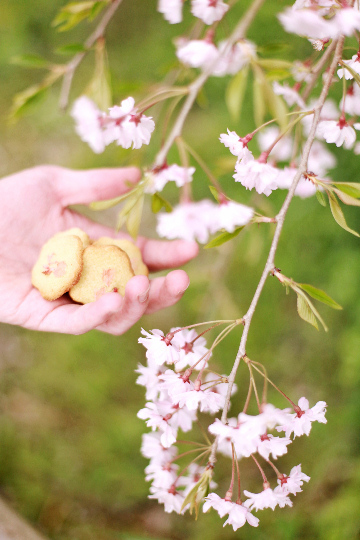 These pretty blossoms are prepared by first pickling them in salt, then in umezu, or ume plum "vinegar" (which is not really a vinegar but a sort of brine you get when you make umeboshi); they are then semi-dried, and packed in salt for preservation. Umezu brings out the bright pink and adds its characteristic vinegary flavor, which some love, others don't. To be completely honest, I'm not very partial to this peculiar flavor. But I have trained myself to enjoy it, though in very small amounts. This is definitely an acquired taste, mind you. Then again, they certainly look pretty, and makes an excellent topping for anything. Just make sure you rinse them first, and soak in a small bowl of water for a few minutes to remove excess salt. They are also praised as a "tea", thus called "sakura-cha (cherry blossom tea)", to be served traditionally at engagement ceremony; it is not a "tea" really, but the way how a blossom "bloom" in a teacup is certainly graceful. 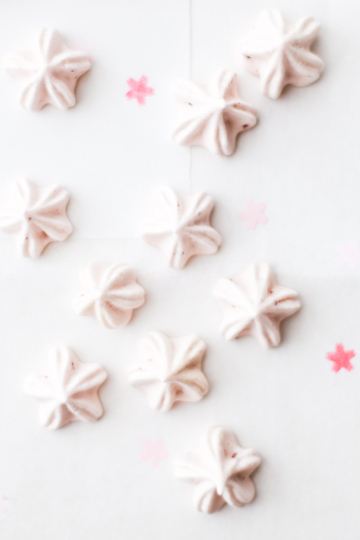 Like I also mentioned in my last year's sakura baking post, you can "bloom" the blossoms by popping them in the microwave: rinse, and gently pat dry blossoms, place them on top of a sheet of paper towel, and heat in microwave until they dry a bit and pop open. Cooking time will depend on the microwave you use, but it should not take more than a minute; some may bloom in less than half a minute, some may take a little longer. So keep an eye on them as they cook, or they might get too dry - or burned, even. 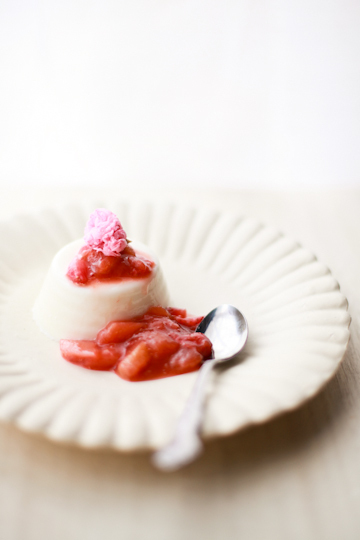 Here I used a blooming blossom to top sakura panna cotta with stewed rhubarb and strawberries. Er, I could probably have made a little more effort to make it look prettier, but I'm sure you'd be more successful than I was here if you ever tried it. But even without the blossom perched on top, there was anther sakura factor; both pannna cotta and stewed fruits had a few drops of cherry blossom flavoring, though you could do just either. It's a nice way to make something really simple a bit special. That said, this panna cotta may actually have been the most complex thing I've made this time with all the sakura ingredients; other things were all very simple, and would have been quite plain, even a bit dull, had they not been sakura-ed up. 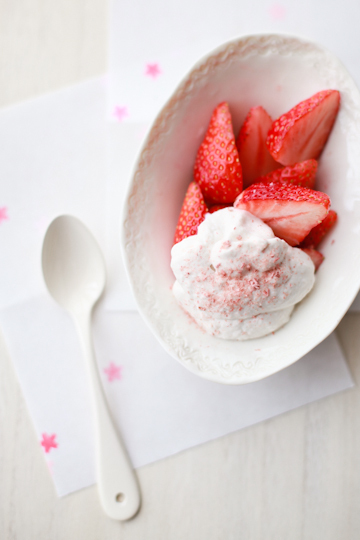 Take this good old strawberries and cream; I folded some sweetened cherry blossom paste into lightly whipped heavy cream, and served a few dollops of it with fresh strawberries. Topped with a shake of cherry blossom flakes, strawberries and cream with sakura looked simple yet pretty - with hint of sakura. The paste, I thought, was rather salty than sweet, and I might like to try it in baking - madeleines, financiers, or other simple tea cakes. And the simplest of all? sakura toast; toast some white bread, butter and then sprinkle with sakura sugar. That's it. I really think it's best to use the sugar in a simple way to enjoy the flavor. The only thing you should note is to use unsalted butter, as the sugar has a bit of salt in it. 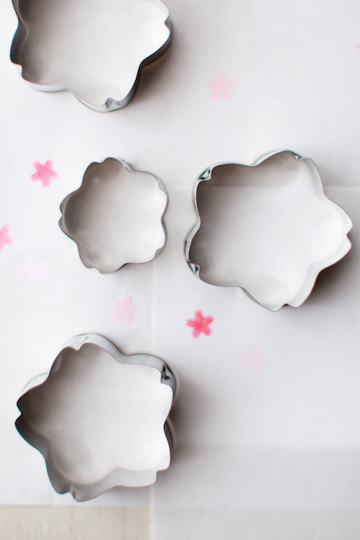 We have sakura-shaped cookie cutters in a few different sizes, and here I have a one with 51-mm (2-inch) diameter for you (larger ones in the picture; the small one is mine (35 mm/1.4 inch)). You can use it to cut out sakuras from anything you like other than cookies, up to about 10-mm (0.4-inch) thickness. I made these a number of times last spring, and I've been baking them again; in addition to looking pretty, they taste really good as sweet and salty, thin and crunchy. 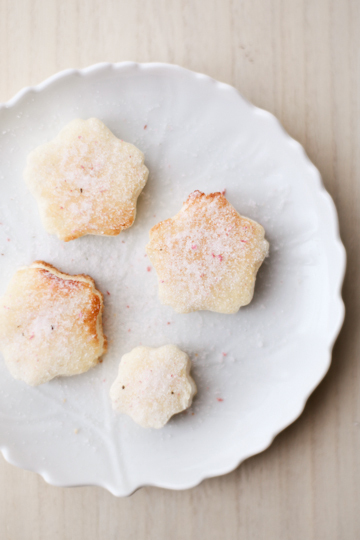 Other than the use of cherry leaf powder, these also have melted white chocolate in the dough, adding a sweet milkiness to the cookies. The pink flecks are sakura petals removed from salt-cured cherry blossoms, rinsed and dried a little in the microwave (not "bloomed"). The recipe is in Japanese, but you can try and google translate it (here in English) to get a general idea; you use only a small amount of cherry leaf powder (1/2 tsp) nut it's enough to give the cookies a pleasant hint of leafy flavor and just a right saltiness. 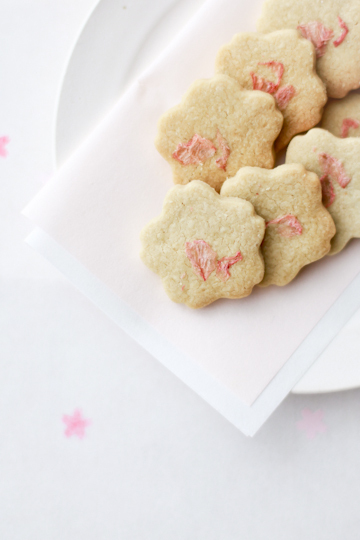 Now, perhaps you might like to try slightly different sakura cookies, as well? Um, if you wondered like where are sakura cookies?, you are not alone; my own mother did, too. Anyways, these are supposed to be sakura meringue cookies, flavored and tinted with freeze-dried strawberry powder and a bit of cherry blossom powder (dried and grounded salt-cured cherry blossoms). You don't have to do the topping, but I like the pretty shade of pink and a very subtle sakura flavor. 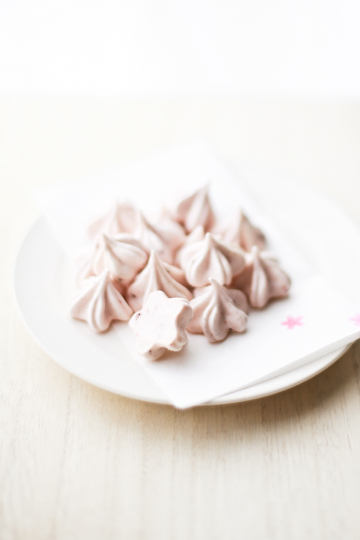 I tried and made something similar last spring, using only cherry blossom powder - and ended up with flattened blobs of salty meringue. So this time I followed this recipe (in Japanese) that use freeze-dried strawberry powder, and added a bit of cherry blossom powder. 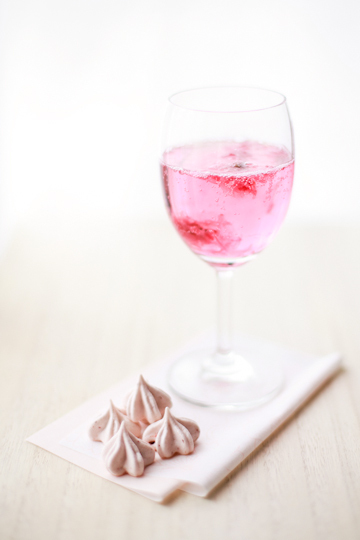 This produced a most dainty morsels in a delicate shade of pink that were airy and crisp. 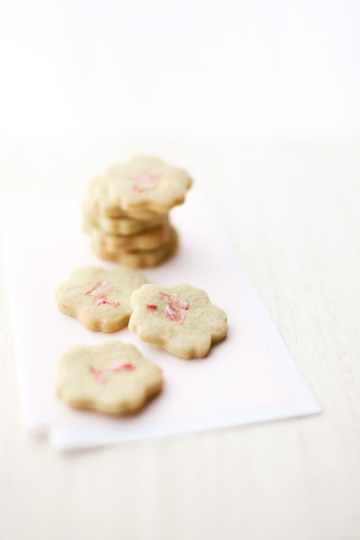 Like the other sakura cookie, you'd want to use only a bit of sakura powder (1/4 - 1/2 tsp) as a little amount goes a long way. Sakura pastry tips also come in several different sizes, but here I have a small one (about 6-mm (1/4-inch) opening). 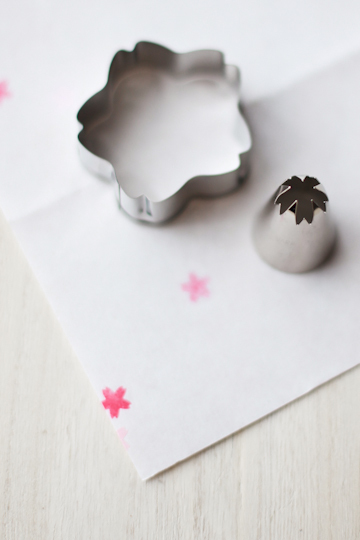 I may not have done a very good job of showing how you can use the tip to pipe cherry blossoms, but you can see other bakers taking a better shot at it; many use it to ice cakes and make cookies (even macarons! ... though I guess they'd used a larger tip). 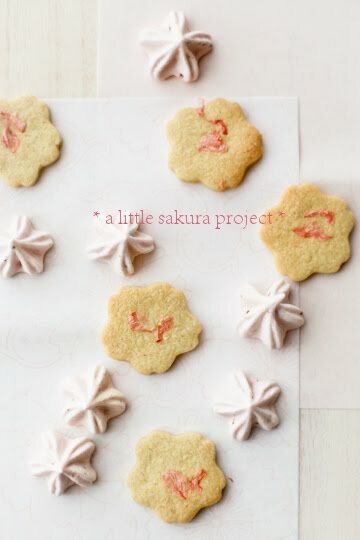 Now I am planning to include one small sakura pastry tip in my sakura set and have already ordered a few for the giveaway, but I have not received my purchase yet. Due to obvious reasons, there are major disruptions in Japan's postal and package delivery services in some part of the country at the moment, but I am currently in an unaffected (or minimally affected) area. So I expect to receive my purchase sometime soon, but if it doesn't turn up soon enough, I might have to leave it out of my set for the giveaway. The same goes to another thing that I plant to include in the set: matcha (green tea) powder from Uji, Kyoto. Bright green in color and burst with flavor, it's a good-quality matcha recommended for baking and dessert recipes, though you can also use it to prepare a traditional cup of matcha tea. I know this in itself has got nothing to do with cherry blossoms, but matcha pairs beautifully with sakura in cakes, desserts and the like, so I thought I'd throw it into the mix. So let's hope I'll receive it soon! * 3/18 update: I have now got both pastry tips and matcha! So they are definitely in. 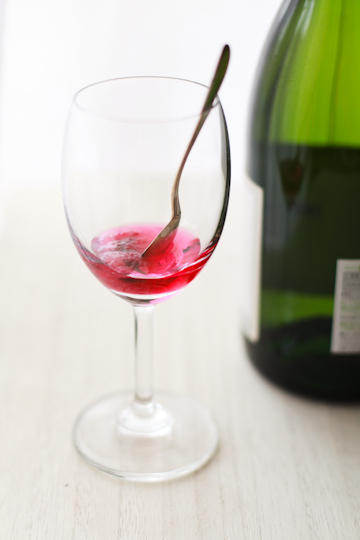 In contrast to its shade of shockingly bright fuchsia pink, this pouch of cherry blossoms in syrup has a surprisingly delicate flavor - when used in moderation, that is. This, too, is basically salt-cured cherry blossoms, rinsed and steeped in sugar syrup; it has some umezu also added to it, and is tinted with red cabbage color. And no, you don't smell or taste cabbage but the same distinct smell of cherry blossoms. Don't you just love this shade pale of fuchsia? Pink really isn't my kind of thing in general, but this still put a smile on my face. I was surprised to find it taste quite nice, too - just a bit of saltiness, a hint of vinegary umezu, and a subtle flavor of sakura. In fact, this might have been my favorite among all the sakura products. Some of other products such as sakura jelly and sakura sauce (and the sakura-honey syrup I tried last year) seem to be made using this - syrup and/or blossoms. * Not shown in the picture above. Plus, each set will also include a pack of kaishi, which is a type of paper napkin traditionally used in tea ceremony. 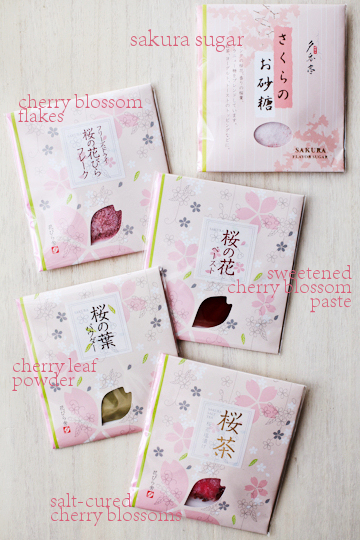 I have packs of them in a few different sakura patterns (like the ones you can see in some of the pictures in this post), and winners will find which one they got when they received their package. I have 3 sets to offer you. For your chance to win one of the three sets, please visit my fundraising campaign page and make a donation for the disaster relief efforts in Japan. - All donation by anyone from anywhere in the world will be welcome, and mostly appreciated. However, only those who live outside of Japan are invited to enter the giveaway. 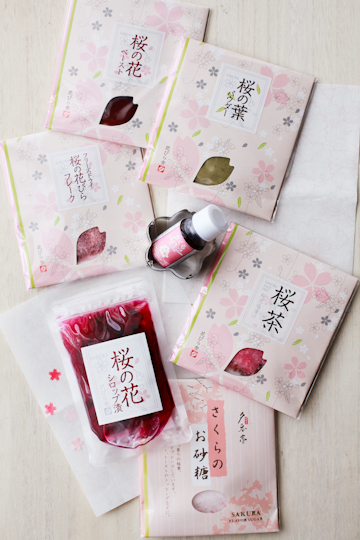 This is based on my original intention in doing this giveaway, which was to offer a chance to give people outside of Japan a chance to get a hold of some of cherry blossom ingredients that are really hard to find for them. Thank you for your understanding about this. - The set contains food items. I tried to pick items that should be relatively safe for international shipping and customs clearance, yet different rules and procedures apply in different countries. If you are unsure whether or not you are allowed to receive certain food items sent from abroad, I suggest you consult relevant sources before you enter the giveaway. - Giveaway will be closed on Monday, March 21, 2011. Three winners will then be selected randomly, and announced here on this blog within a day or two. The campaign page may be kept open for non-giveaway donations - details will be decided and announced in due course. - Your donation will be made to the International Rescue Committee (IRC). Now, the situations in Japan have changed since I wrote my last post to announce this project and the campaign page. Chances are that you've seen numbers, read stories, watched footage, and even heard rumors. So I will not repeat any of it here. Moreover, we are in middle of a fluid situation, and anything I say here may not be true in a matter of days, or hours, even. 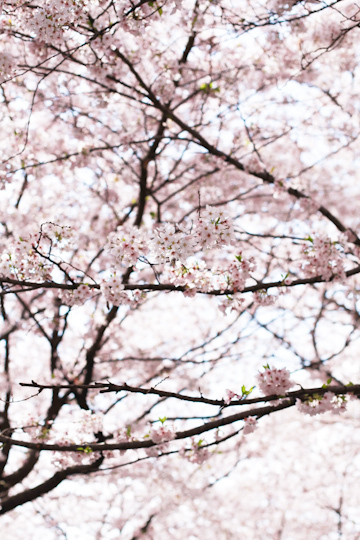 - I planned to send out packages to winners by regular airmail, for them to reach their destinations by the end of March or beginning of April, in time for cherry blossoms. However, Japan's postal service is partially disrupted in some parts of the country, which may cause delay in delivery of my packages. I already have most of the items that go into my sakura set and am waiting for the last few things (i.e. pastry tips and matcha) to arrive, but if I don't receive them by mid next week, I will send out my packages without the two items. As of March 16, a central part of the prefecture of Nagano where I am has so far seen little disturbance or confusion in public service or transportation. But it can change at any moment, and it is not unlikely. All of my families and relatives were safe immediately after the deadly quake and tsunami last Friday, but so much has happened since then, and now nobody really knows if we will be. - Considering this, if something happens to me in the coming week or so, I may not be able to put my words here into action. More specifically, there is a chance that I may not be able to ship out my packages, or even choose winners. I fervently hope that we can let this pass as a bad joke, but as it stands now, we really don't know. So please keep this possibility in your mind when making a donation and entering the giveaway here. Good news is that no matter what happens to me, your donation will still go straight to the IRC, and will sure be put to good use. So far, over 3,000 dollars have been raised - I feel extremely grateful, a little overwhelmed, and very encouraged. Thank you very much again to each and every one of you who have made a donation, and/or passed the information along. Please take a look at my campaign page - I have updated a few details. I have also heard that Pim of Chez Pim and Keiko of Nordljus were planning a special Menu for Hope for Japan, so let's wait for their announcement to come. Lastly, may I ask you one great favor: please give what you can give to help. Make a donation, spread a word, or perhaps give us something that makes us smile. Many people who have survived the disastrous earthquake and tsunami and those are now threatened by the ongoing nuclear crisis are in desperate need of food, water, heat, and safe shelter. We try to help each other and stay strong. As we do so, we also need something that makes us smile, uplifted, or maybe relax, now that everything is ever so bleak and gloomy and gravely subdued (for good reason, of course, but still). I feel that we could do with something funny, beautiful, and/or delicious in our life now more than ever. There is this old saying in Japanese, "winter always turns to spring". Even when the life is hard, we will not give up hope and hold out until it gets warm and things ease up. That's exactly where we stand now, except we must make every efforts to make winter turn to spring. Thank you so much for your prayers and support for Japan in this difficult time. Glad to have helped. Your safety is the most important thing, don't worry about the rest of it! I hope everything will be okay. Will continue to pray for Japan. Please take care. Glad that you took the effort to set this up for the cause Chika. We hope what little we are able to give will help. We keep praying for you and for Japan. Much, much love from Italy. I think what you are doing is amazing. It's been heartbreaking watching what has been happening in Japan and we all want to help in some way. With all that's happening in Japan right now, your beautiful photos take my breath away and make my heart ache at the same time. Beauty is fleeting, is it not? Just like these fragile cherry blossoms. Thinking about you -- please do take care. In Barcelona it start many solidarity actions for Japan!! We wish you the best and every day we follow the news about Japan, we have some friends in Toquio and Osaka too....take a lot! GAMBATE!!!!! I have just done a post about your beautiful gesture on my own blog. So I hope that will bring you some more prayers and more support. Your lovely images and gesture are quite heart-breaking! Keep safe. With warm hugs from Australia. Hope for Sakura is a lovely gesture. I am posting this on the The Spirit of Pistoulet Facebook page since it is all about giving from the heart. Living in California, we are familiar with earthquakes. But, I can't imagine the terror you and your countrymen must be going through. Please know that the whole world is watching and wanting to help. On a cooking note, I would love to purchase one of those baking sets. Totally serious. You really did a marvelous job putting everything together. I have never heard of or eaten Japanese desserts and I think I'm in love! Again, your whole country is in our thoughts and prayers. Our thoughts are for you and your country. Dear Chika - I found your beautiful blog and very heartbreaking post via my dear friend over at 'BlueFruit'. I have watched the nightmare situation evolve since the day of the earthquake last week, and my thoughts are wrapping you in warm embrace. To fully grasp what has and is happening is impossible. We see the cruel aftermath of devastation, pain, loss and destruction on the news. The stories that come through go straight to our hearts and our prayers go to those affected. There has been a big movement to support 'ShelterBox' for Japan. So far over $20 000 has been raised. I hope that you feel the well intent, love and support from all corners of the world - the tangible world as well as the virtual one. Thank you for your post and for even finding strength to write to us at this gruesome time. Warm regards and big hugs from Sydney. On a lighter, sweeter note, I don't know what to do with all my sakura ingredients... I think I over bought them a few months ago and some will expire soon.... I did the macaron thing..etc, etc.... cupcake...I need some ideas? How kind of you to offer an incentive/giveaway at a time when donations need to be made with or without material reward. I'm so glad for the response Hope for Sakura is getting! (and I'm so excited to have discovered your blog through it - I'll be back regularly!) With my many friends in Japan, the country and its people are heavy on my heart and filling my prayers. Much safety wished on you and your family. Chika-san, kono post doumo arigatou! Belgium no hou kara mainichi u-stream ya facebook de news o follow shitemasu. watashi mo cupcakes toka tsukutte, sore o utte, sukoshi dake donate dekiru koto ga dekimashita. demo Chika-san no giveaway saikou da to omoi masu. watashi mo Kobe ni shinseki ga nokotte masu, 16-nen mae no great Hanshin earthquake omoidashinagara, Tohoku no hinansha, nakunatta hito, mada yukuefumei no hito no tame ni inotte masu. sending lots of positive thoughts! Am I too late to contribute & enter the giveaway? I am organising a Japanese afternoon on Sunday with Japanese tea and food, cloths/books/etc swap to raise money and an origami session. I don't think we will raise that much as it is only a few of us unfortunately but hopefully still something. Is the IRD a good and efficient organisation or would you use the Red Cross? once again, thanks so much for all your thoughts and prayers - and thanks, too, to those of you who are raising fund on your end. i'm in awe of the support we are getting from many corners of the world in these difficult times. elle marie - you can add a sakura flavor to pretty much anything... cakes, cookies, mousse, ice-cream, even bread. Francesca - thanks for doing a fundraiser... the red cross and the IRC should both be good, so should a lot of others. it's up to you. a manufacturer details as email/adress.. would be much appreciated. A year have passed and I'm still thinking about Japan. We did a memorial in the town I live in honor of all our friends and family we lost there. I have a question though, if I want to buy to sakura goodies in tokyo, where should I go?? It's almost sakura season, can I found them in any conbini or depato?? Take good care of you!